Encaustic Painting 8" x 6"
Gay : "I am exploring the theme of Migration in this recent series of Encaustic, [bee’s wax], paintings. 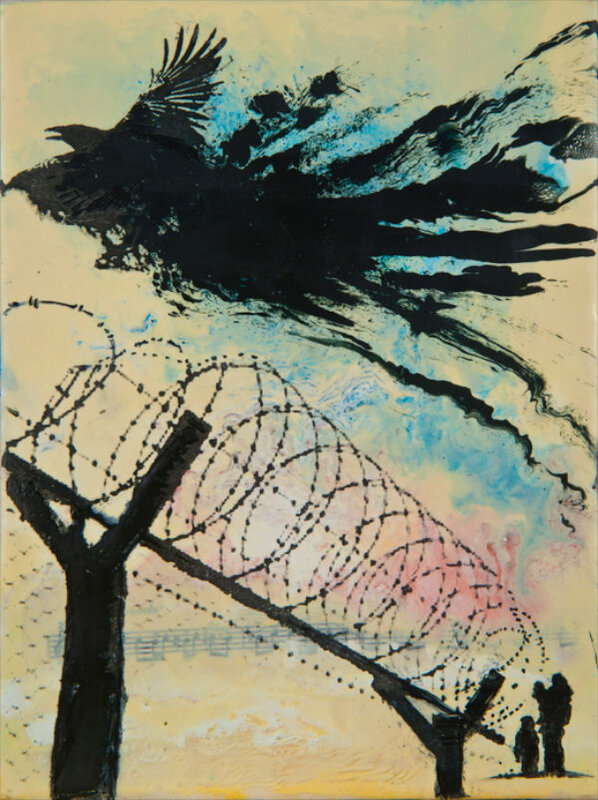 Creating animals passing from one region to another for feeding or breeding led me to creating images of the global crisis of people forcibly displaced by conflict or persecution. Antelope leaping across sun drenched dusty fields, wolves moving over frozen tundra, a solitary weary traveler or desperate people traversing treeless plains speak to my brush. I work in a variety of media and in this work I am incorporating my love for drawing, painting, and composing visual stories. The encaustic wax medium allows me to work in layers, trapping fragments of color, memory and message in time. Working with the molten wax on birch panels is engaging a mix of alchemy and jazz. Colors are worked like chords until the metamorphosis of substance and meaning cools to a finished statement."